The limited-edition “Made in America: Building a Nation” Forever stamps feature photos taken by iconic photographer Lewis Hine. The Labor Department and the Postal Service have teamed up to honor courageous American workers who put their hands and hearts into making the United States a world leader in manufacturing and innovation. 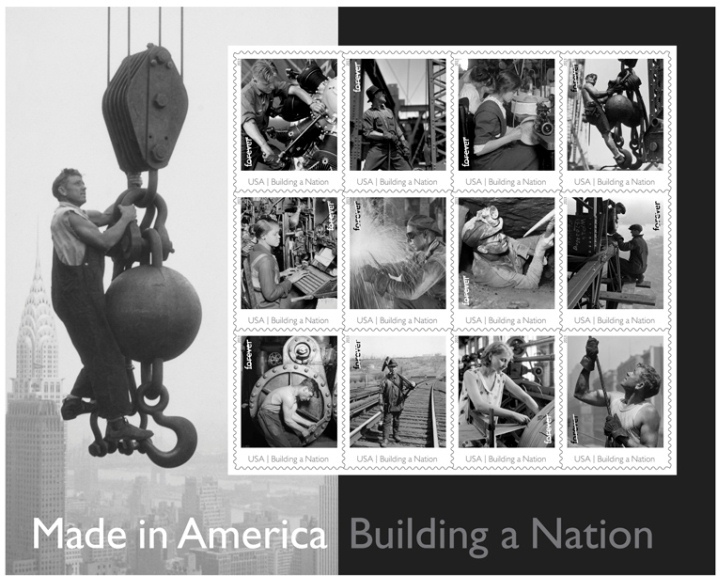 The “Made in America: Building a Nation” Forever stamps, released on August 8, conjure memories of 20th-century industrialism – a welder and riveter atop the Empire State Building, an airplane maker, a railroad track walker and more. Eleven of the 12 black-and-white images on the stamps were taken by photographer Lewis Hine, who spent a lifetime capturing vestiges of 20th-century industry and sparking change in labor law. Click here to watch a video promoting the stamps. “Stamps are like a miniature American portrait gallery,” said Labor Secretary Thomas Perez. “They are an expression of our values and a connection to our past. That’s why it’s so fitting that that this series depicts Americans at work. These iconic images tell a powerful story about American economic strength and prosperity. These men and women and millions like them really did build a nation. A sheet of 12 of the limited-edition stamps with a distinct selvage image sell for $5.52 on the USPS website. Click here to purchase the stamps for yourself.